Although I have not shared any pages yet this year I am still plodding away with this project. 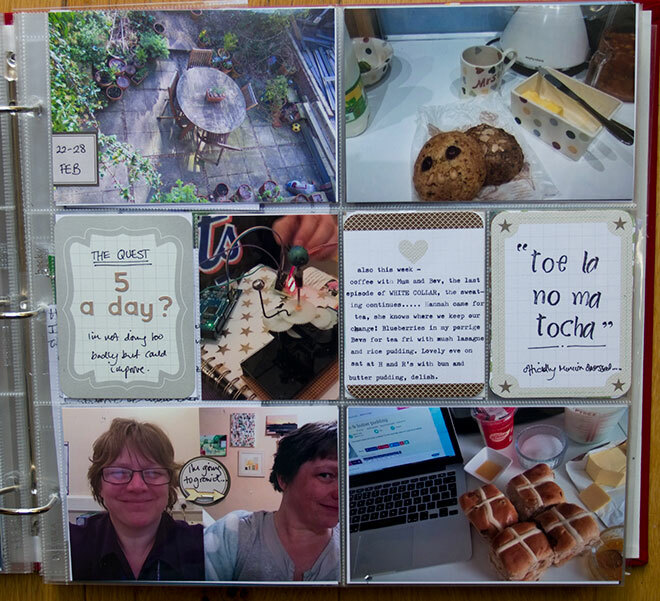 I have found a sort of rhythm with it and so far this year I haven’t got stressed out because I know I have the photos and the notes jotted down so all I need to do is combine the two… no pressure! No, really I am in a relaxed place with this. 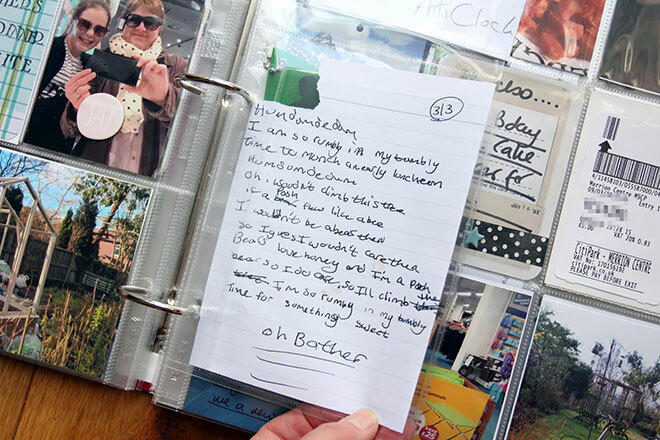 But I think writing something down each week is key other wise you forget and it just becomes a photo album. The other factor that is helping me with this project is the I’m keeping it simple. 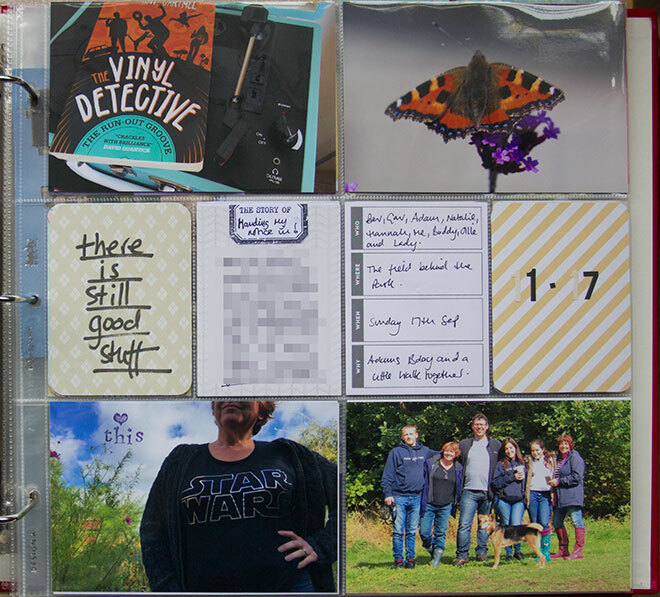 I took a handful of the Project Life cards from the kits I own (see below for details of those) and filled up several weeks of pockets. I tried to keep similar colours for each week and filled all the 3 x 4 slots. 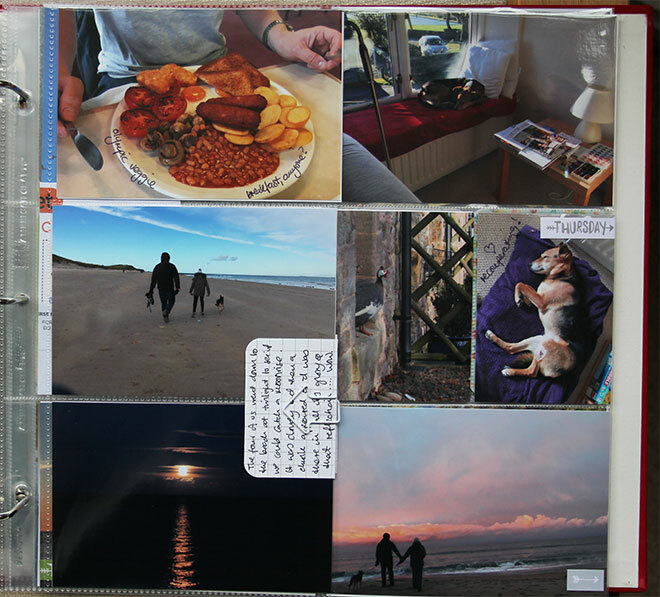 I do a page a week and aim for just four photos, although I often have too many picture and either fill a 3 x 4 pocket with a photo or add an insert of some kind. 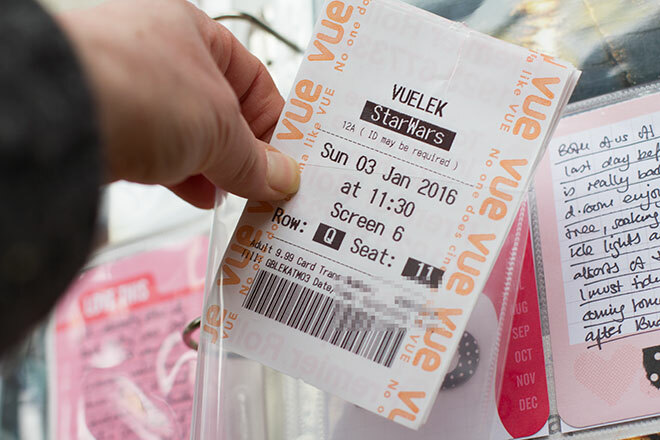 For the first week of the year a group of my family went to see the new Star Wars film and I wanted to include the tickets, as well as having a photo of my niece holding out the long string of them! 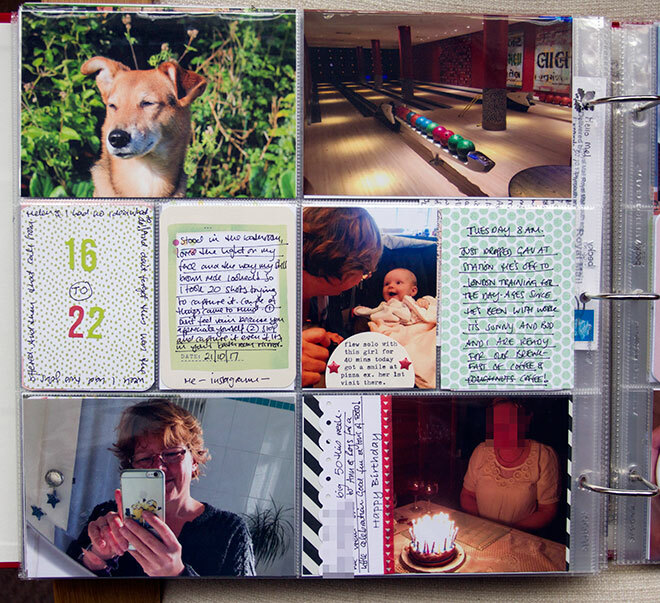 To do that I cut down an old page protector and punched holes so I could add it to the album. 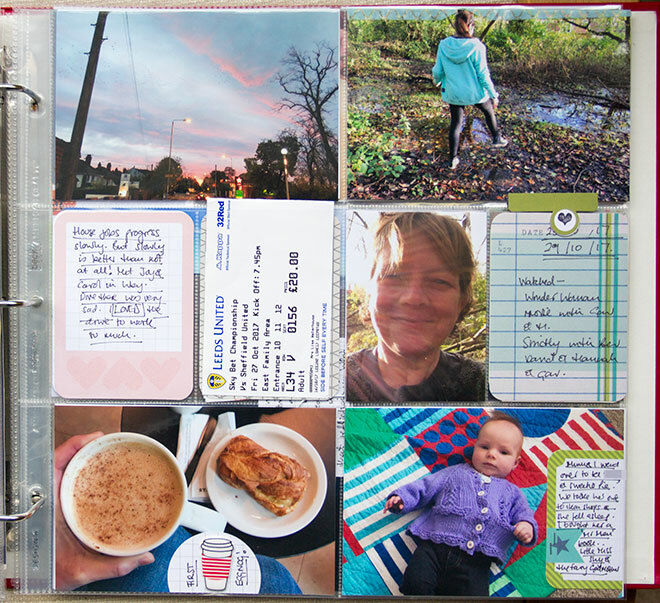 I also am happy to make the whole spread one week if there is enough going on with the photos to fill it up. The second week in January did get a full spread. I wanted to include that series of Buddy and it snowed so I needed to get all those photo in because in case you didn’t know I kinda love the snow…. 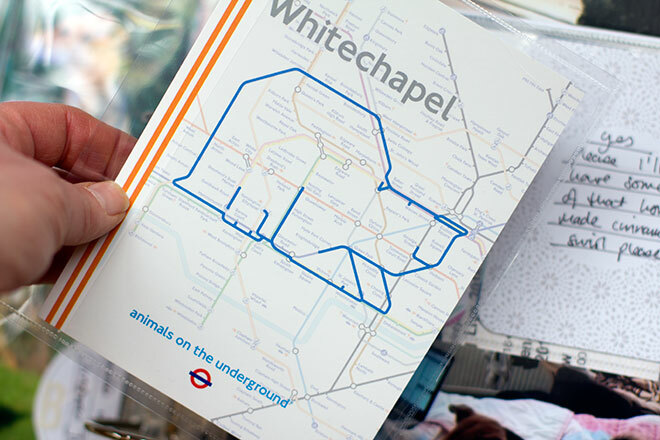 I also love our London underground maps and for Christmas my sister bought me a lovely book of postcards, each design taking part of the map of the underground and filling in certain lines to make animal shapes. I thought the polar bear was perfect for this snowy week. 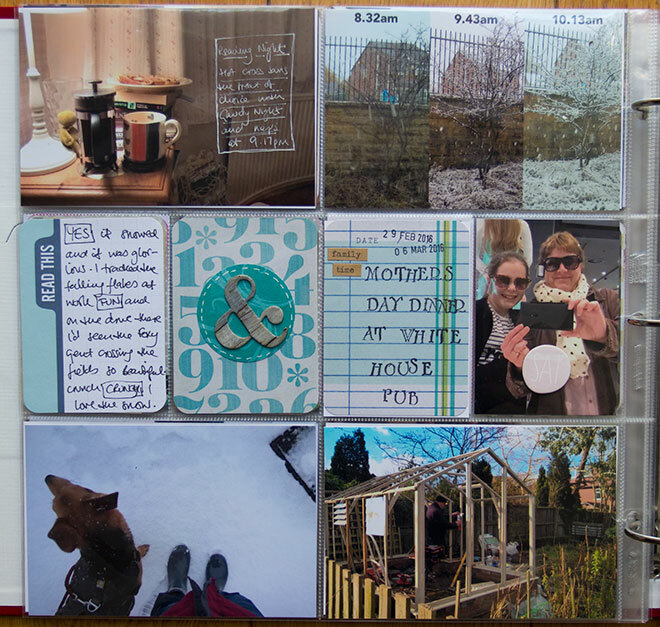 I just cut down another pocket page and added it into the album. Simple one page for the following weeks. Lots of labels. 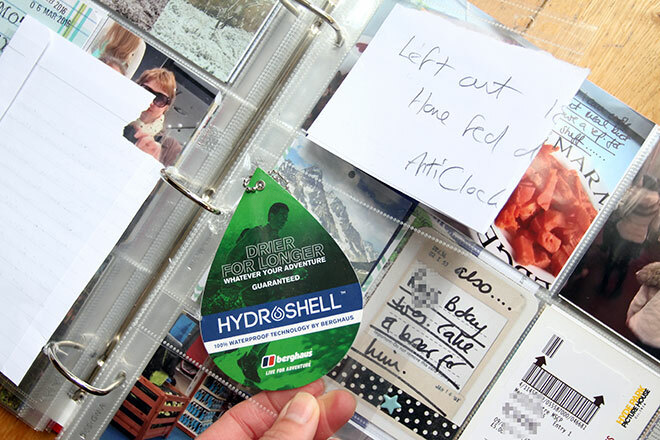 We recently bought a new colour printer so most of the labels on the page below are printed at home. And that was how the year began. 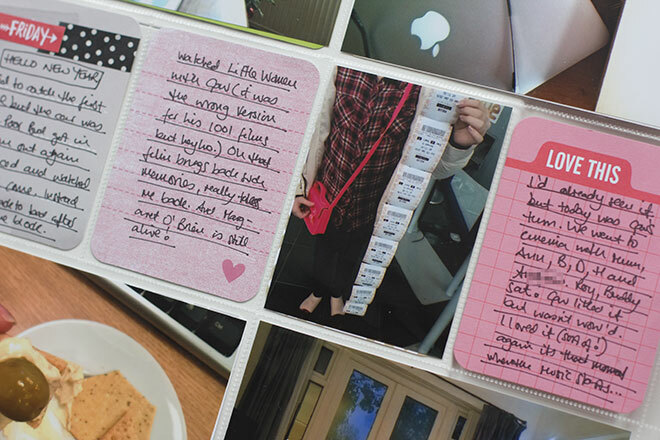 I was filled with enthusiasm in January wasn’t I? Hmm…. 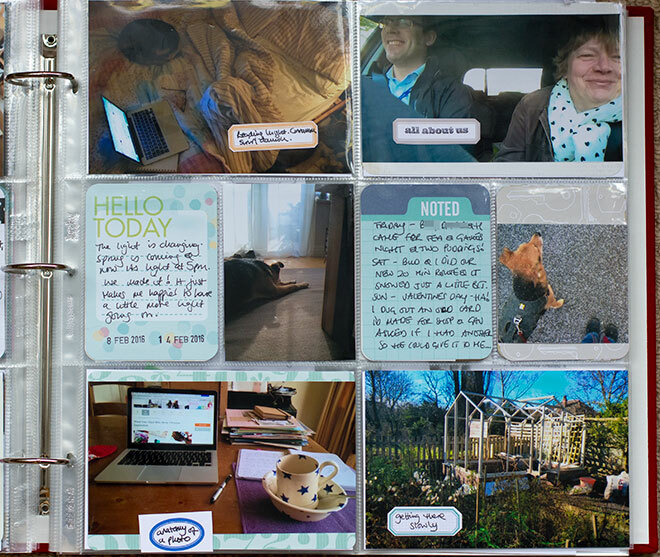 True to my word I have carried on with this project and kept to mainly design A page protectors. I also added two mini kits to my collection of cards while we were in the US . 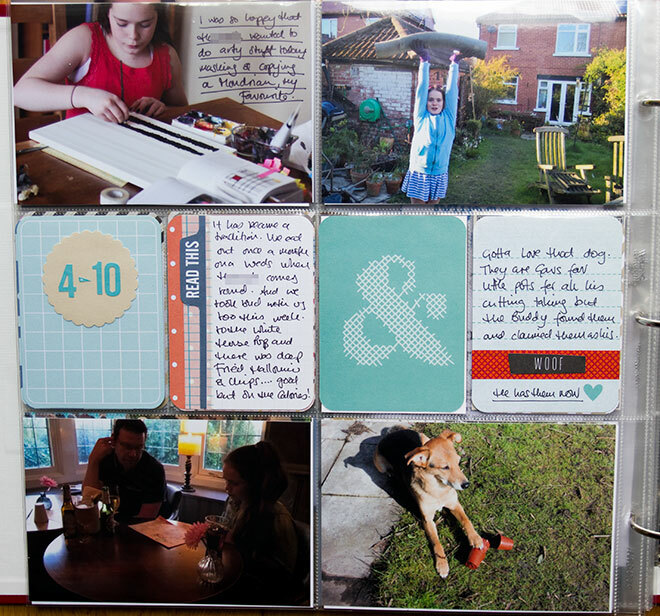 The DIY shop and Dog value kits. I bought them in Joann and they were a great bargain. 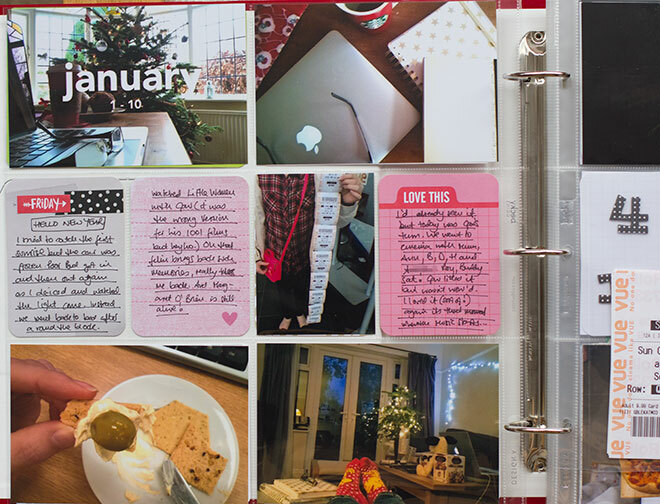 Here are a few pages from January, February and March. 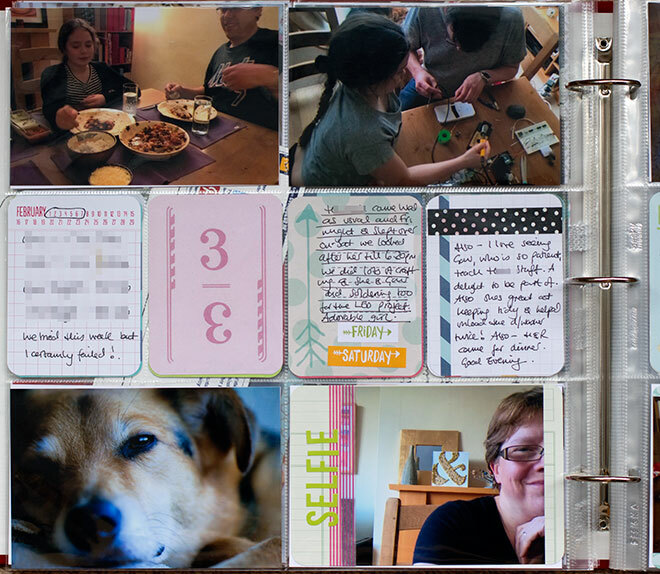 I am adding a few 6 x 12 pages if I have too many photos for just the one spread. 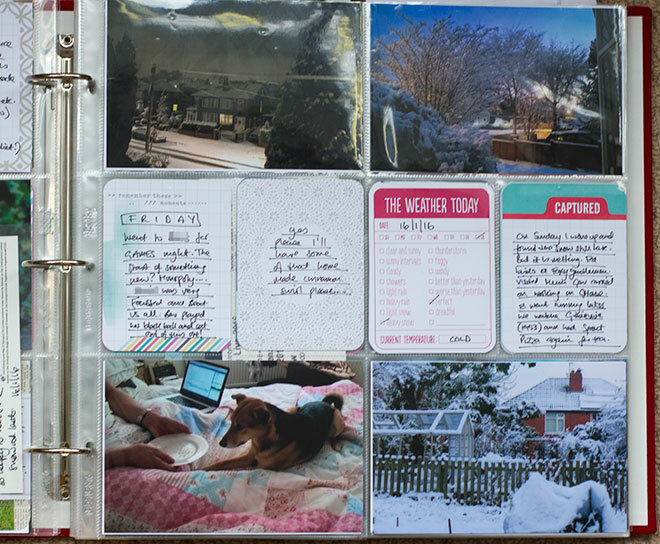 Also trying to include a few clear pages too. Always love how they look in the album. 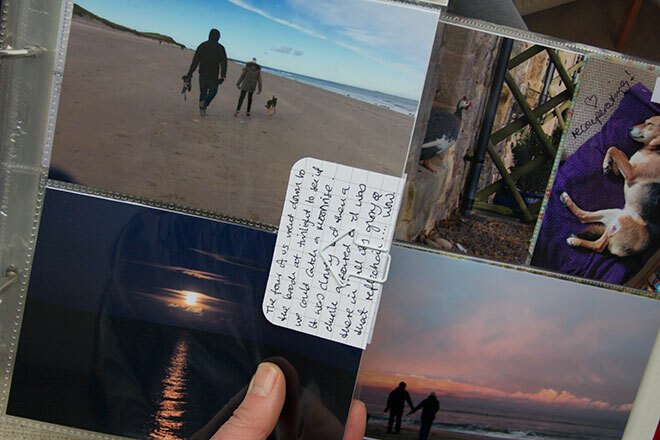 If I can I am using only 4 x 6 photos for a simpler approach when printing ut the pictures using Photobox. 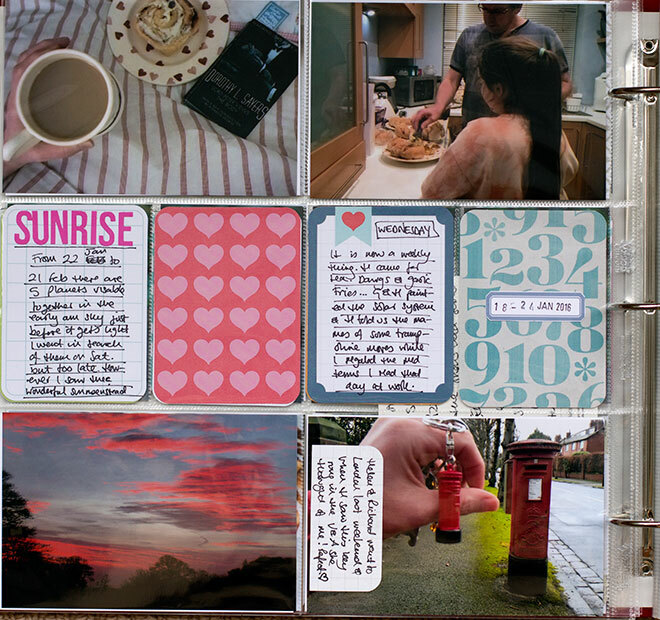 I think I like the look although some of these pages appear sparse I’m going with it. Really loving both the two mini kits as they are neutral and mix well with my older cards. Okay that’s a little bit caught up. 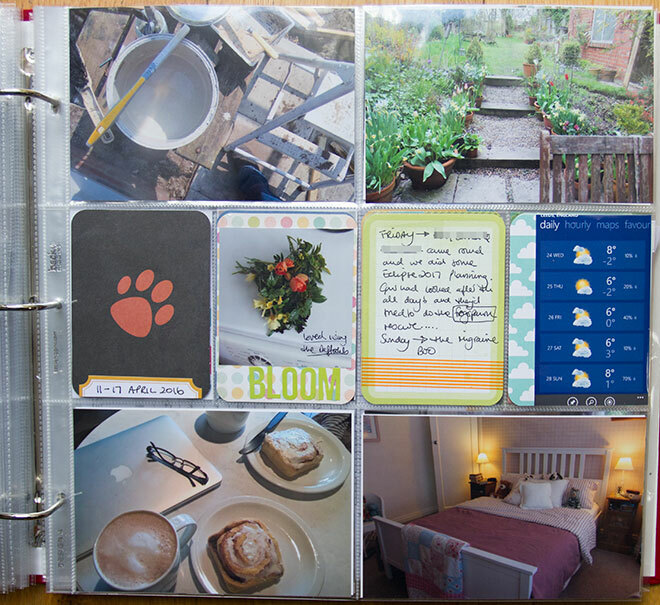 More soon, I promise…..
Project Life® is a memory keeping system developed by Becky Higgins. 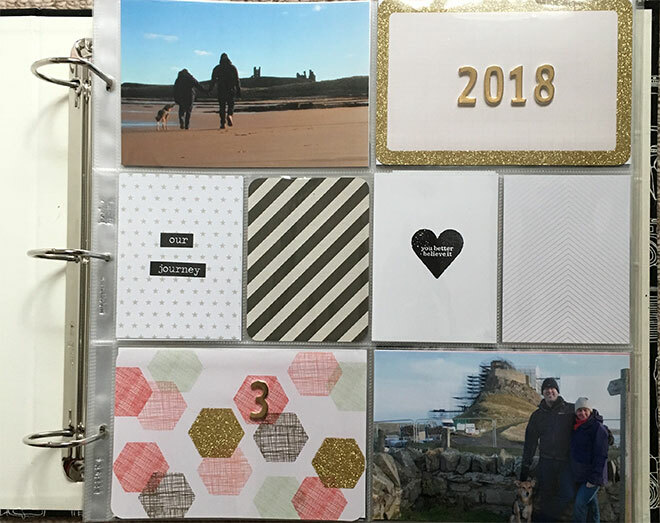 I am using the Honey and the Fifth and Frolic ‘Dear Lizzie’ Core Kits, the Seasons, DIY shop and Dog Mini kits on my pages. 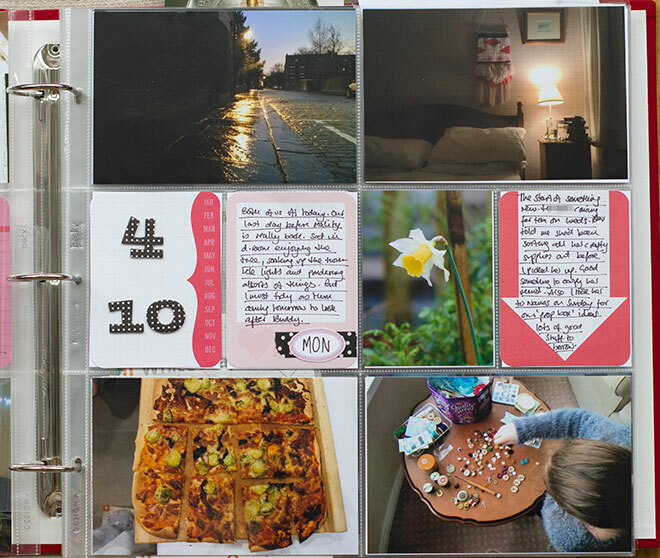 I haven’t shared a Project Life® spread for many months now. I am still doing this project and still love it although my love dimmed slightly in 2014. And I think I’ve worked out why. Last spring I bought a large pack of different style page protectors. I think they were in the sale somewhere and I Like a bargain and thought it might be fun to have different sized pockets to try. Wrong! It was not fun. It was not fun at all. It was hard work. 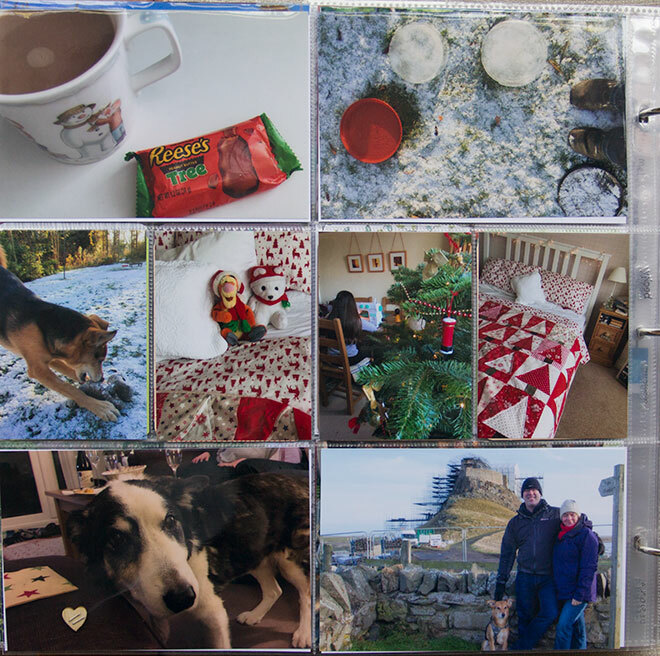 Because I don’t print my photos at home anymore and upload them to Photobox I had to plan each layout then edit the photos to fit the pockets of the page protector I had picked for that week and then upload the photos. 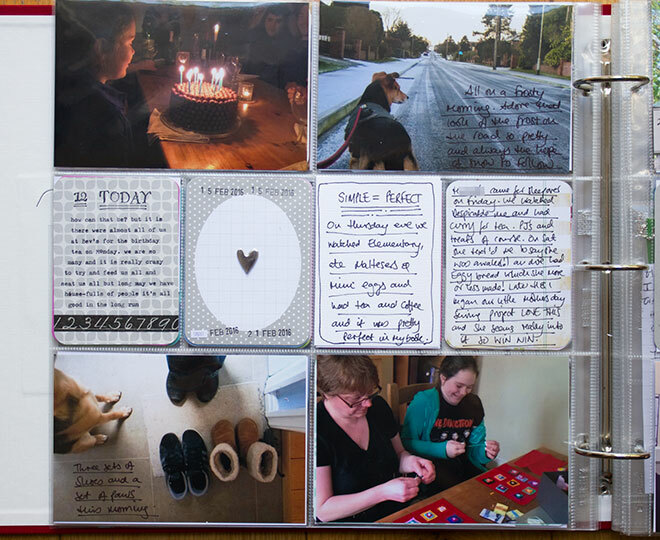 I began to do it in batches on a Saturday morning I would work on the editing and planning then few weeks later I had a new batch of photos to get printed. 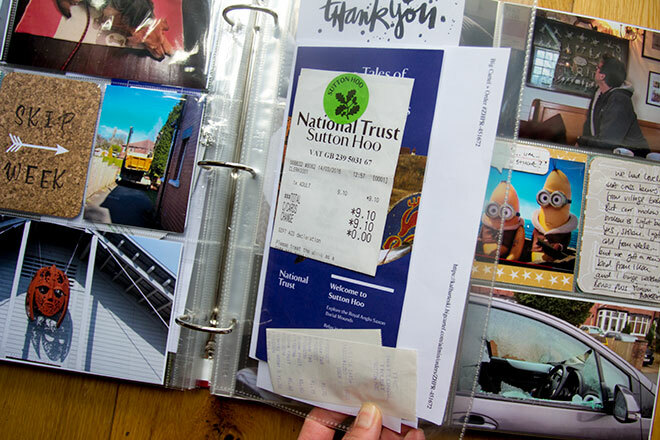 I also got behind in the summer which meant I was trying to sort through months worth of notes and photos. 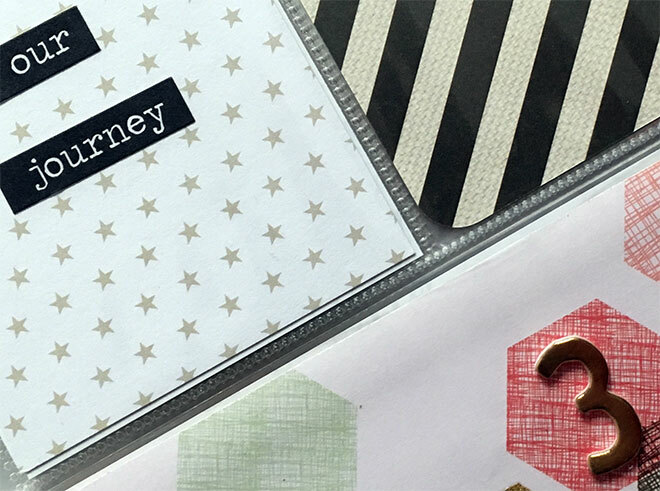 But anyone who knows me knows I’m stubborn so the idea of just going and buying a new pack of design A page protectors wasn’t going to happen. I would carry on with what I had. So I did and I kept struggling. 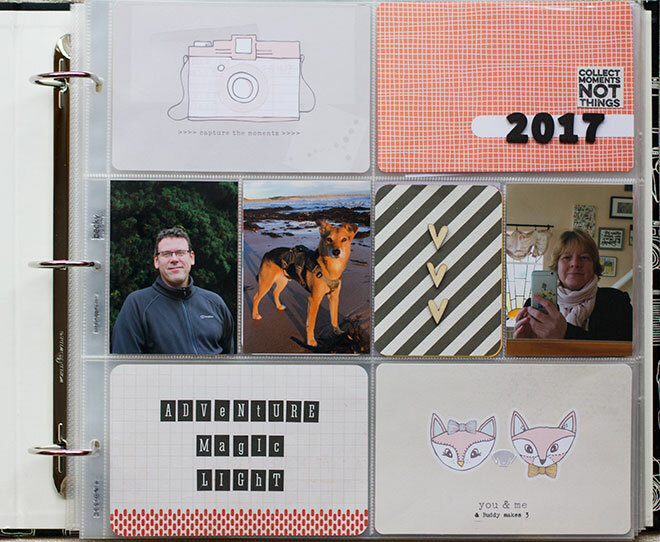 As of right now I have photos printed up till the middle of November and now as we are into a new year I’ve finally given in and am going to finish 2014 with design A page protectors. Simple and done. 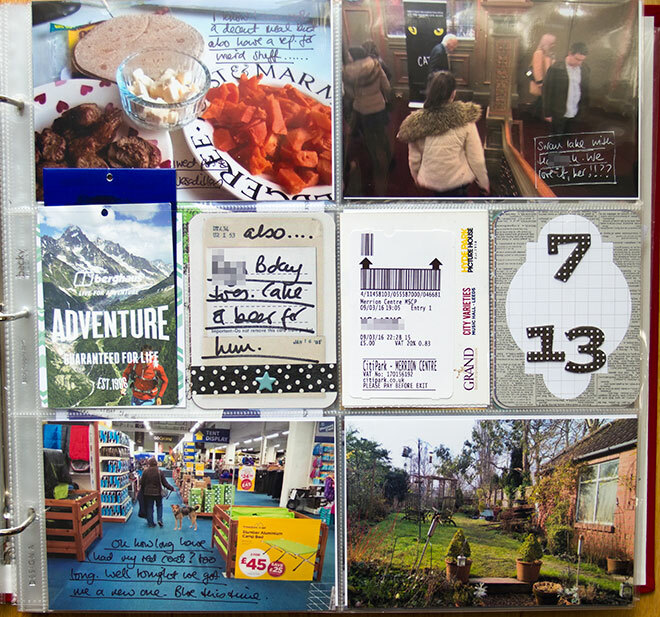 Here are a few highlights from last years album. Loved using my typewriter to add journalling to the cards I even ran that heart and arrow one through the sewing machine. I added lots of wood veneer last year. 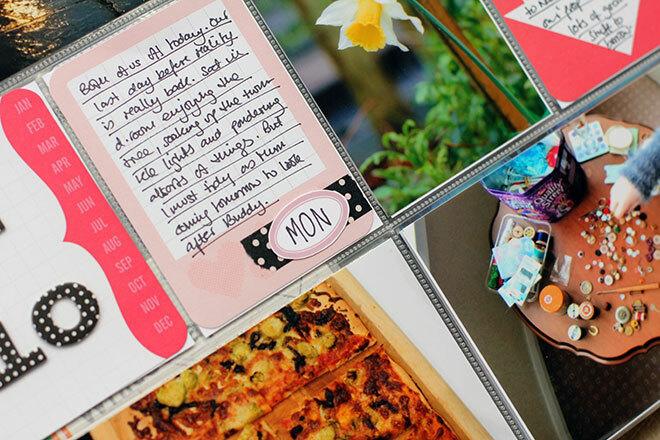 And used cut down page protectors. 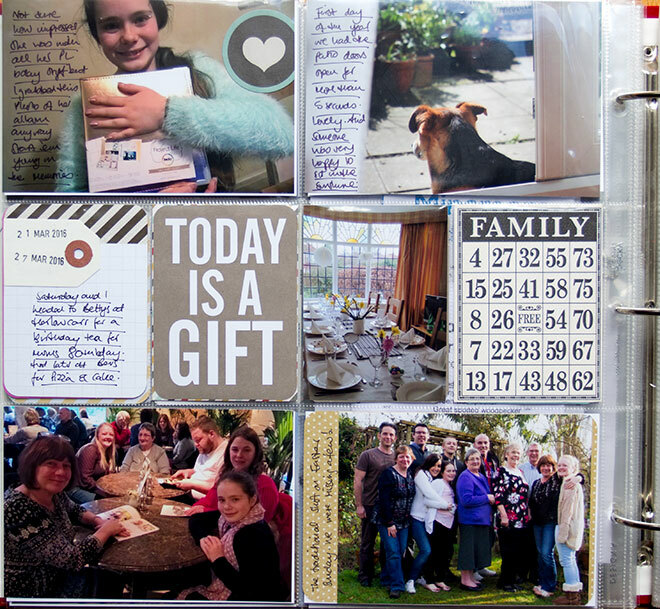 The spread below has a design D page cut to 4 x 12 which gave me two vertical 4 x 6 pockets to fill up. And on the back of that page I added memerobilia. 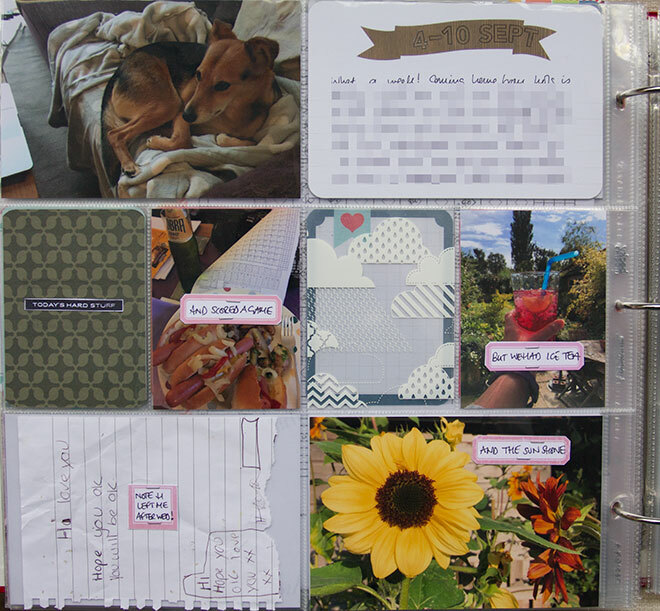 Here is a spread with a mix of lots of handwritten journalling, different sized photos and a few label stickers too. Two different page protectors here and some stamping along with more typewriter type in that speech bubble on the left. Another example of one and a half spreads. My aim is only to use one page a week but sometimes there are too many good photos. 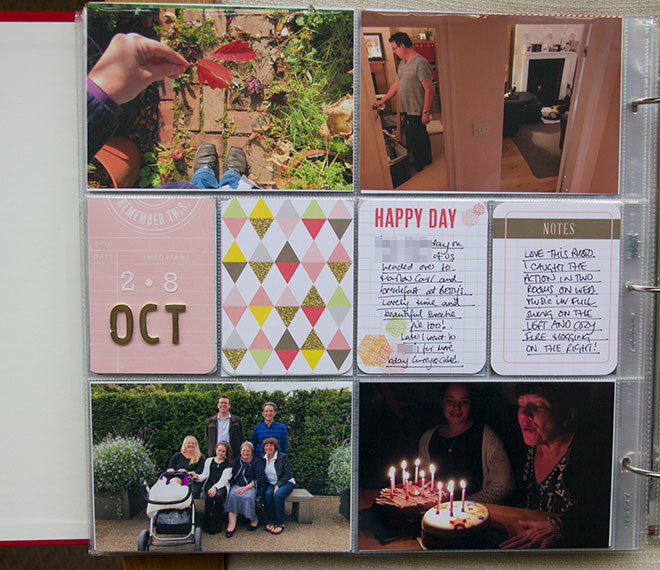 Adding a half sized page is a great option and I like the design H pages, two 6 x 4 and two 3 x 4. I even tried my own handwriting. Looking forward to getting last year finished and on to this year. 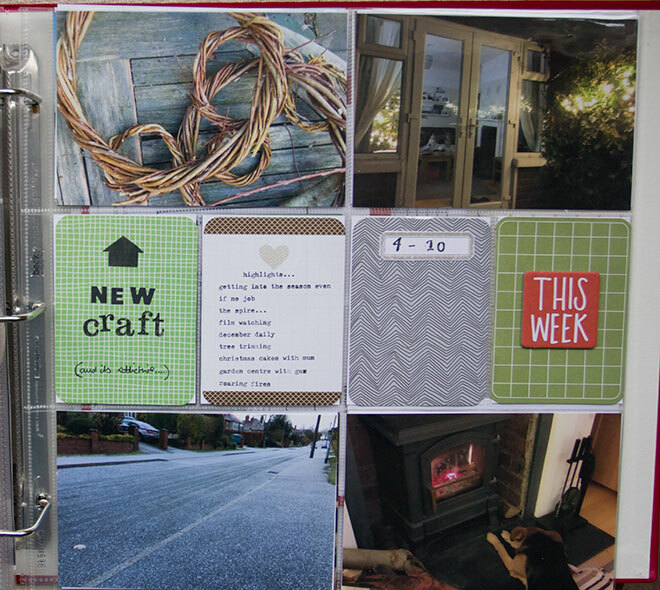 I went for lots of embellishing again for this spread. I am also moving around the ‘date’ pocket to where is fits best. I’m fine with that I think it adds interest and get the eye moving about the page not just settling on the top left pocket. 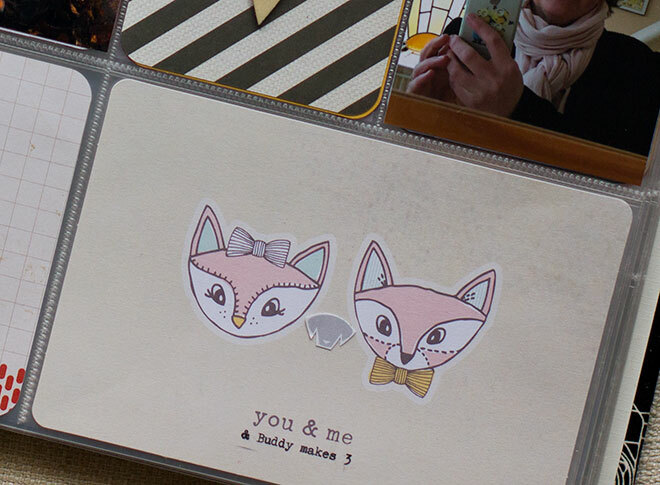 I love that ‘you and me’ card with the little fox faces on it. The top left pocket is a map from Ikea. It’s been a while since we went there. I like the graphic-ness of it. 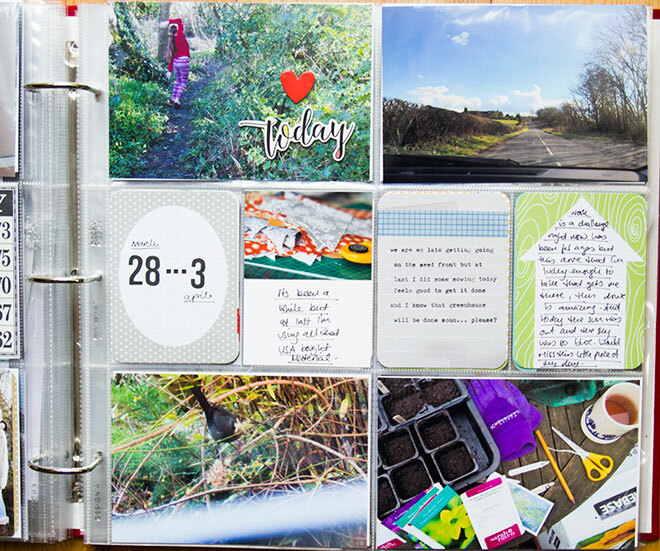 I ran out of design A pages but because I’d already edited lots of photos to fit those pocket sizes I had to crop and chop quite a few of these images to get them to fit. I also struggle with the design D page protector. 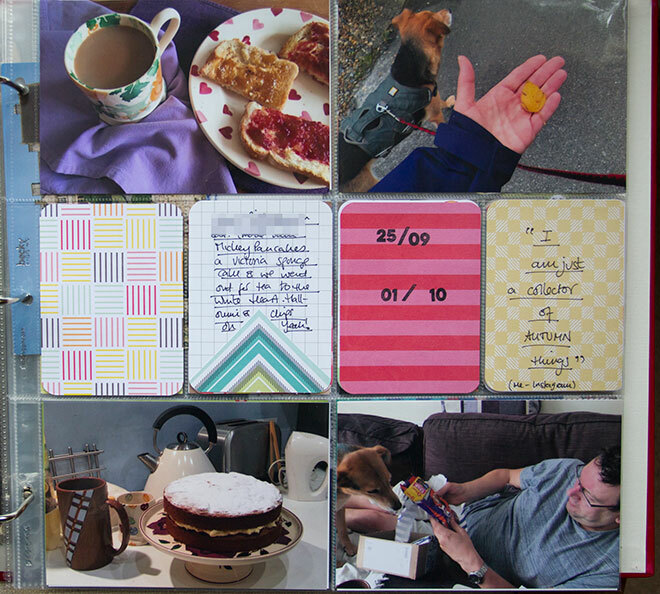 I like that the 3 x 4 cards are horizontal but if I haven’t taken a portrait photos I find it’s tricky getting a landscape 4 x 6 photo into those portrait 4 x 6 pockets. 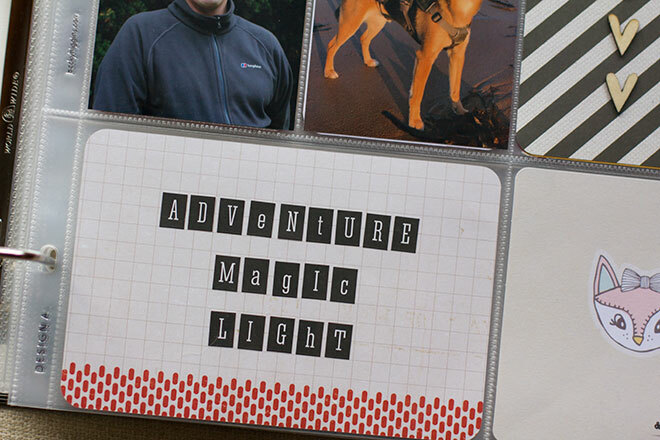 That cute clip board card was perfect to cut into so that it fit over my photo. Here’s a close up. 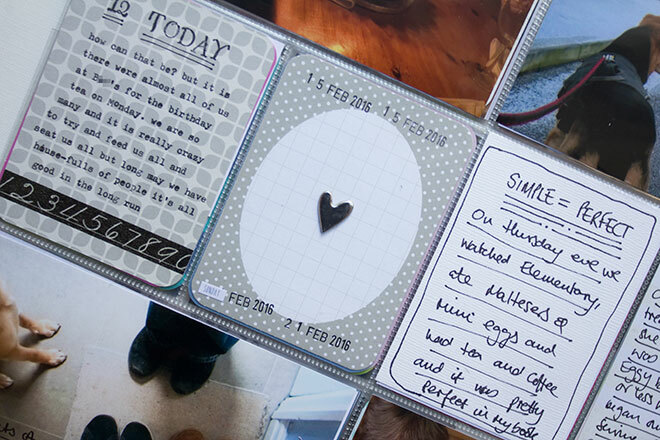 Although it is not as pleasing to the eye, having smaller photos on a larger canvas, it does give the opportunity for lots of embellishments like the Studio Calico speech bubble. I used my type writer to add the text to that and the teeny label on the photo of the leeks. 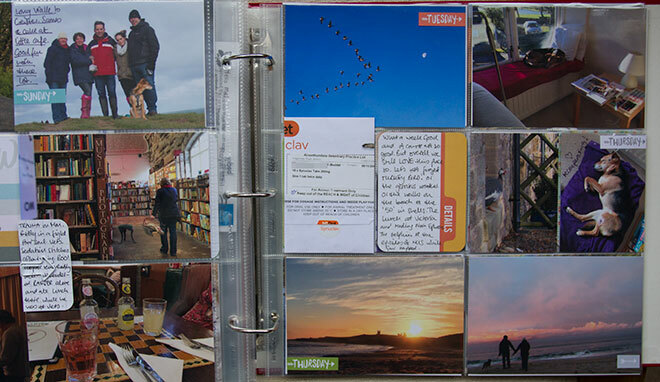 The momentum I have for making the pages is flagging a little but I am keeping going and just ordered some more photos. Here is more from January. 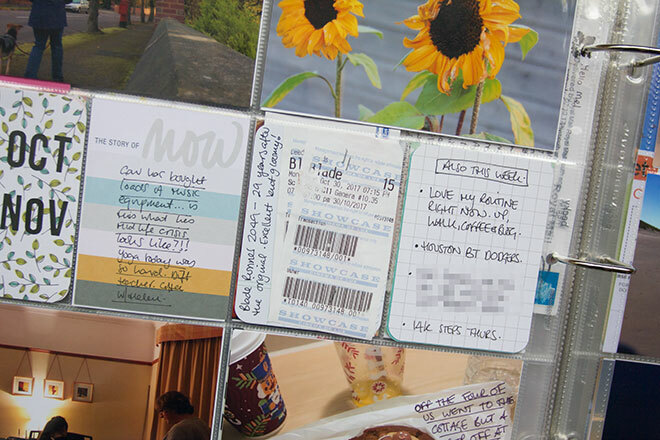 Still a week per page but I worked on them together to keep the colour consistent across the spread. 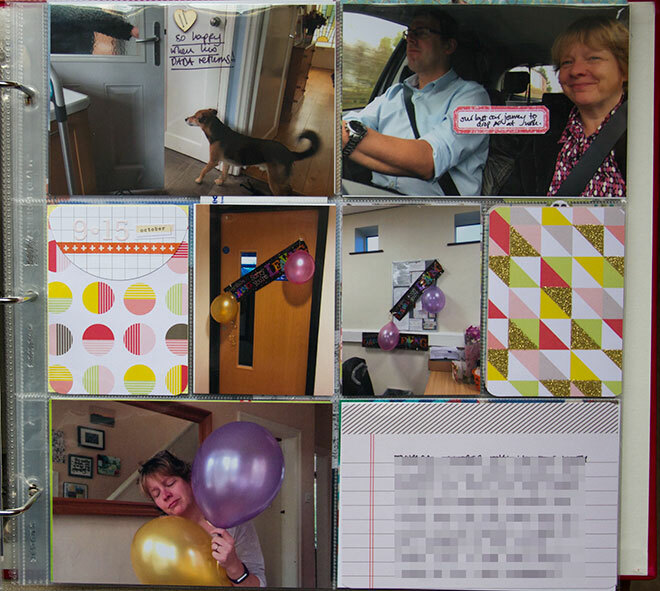 Just love the speech bubble cards. I ran it through my type writer. 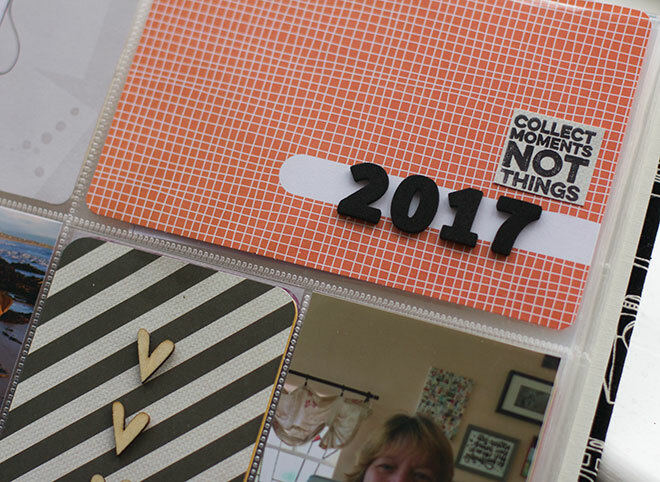 Also used up some older letter stickers to make a bold title for the piano card and the date.